Red Cross HQ invites Freemasons to Presentation. 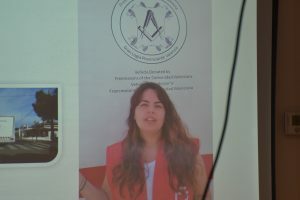 Senior Freemasons of the Provincial Grand Lodge of Valencia were recently invited to the Red Cross Headquarters in Alicante to attend a presentation, both to thank them for their donation of a support vehicle and also to demonstrate what had been done with that support vehicle which had been presented to them almost three years ago. 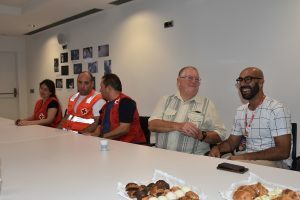 The meeting was arranged by Snr Pedro Dominguez Crego and the Red Cross team who is responsible for alliances and European residents and also for International cooperation. The senior Masons in attendance were RWBro Michael Shilan, the Provincial Grand Master, WBro David Watts, the Provincial Grand Secretary and WBro Trevor Bagnall the Provincial Grand Charity Steward. 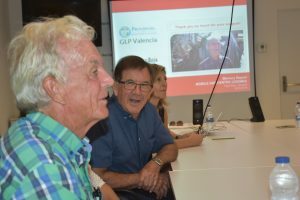 The presentation came about because, over a three-year period, the Province of Valencia held a Province wide festival to raise money for the Red Cross and eventually donated a fully fitted ambulance and two fully fitted support vehicles. 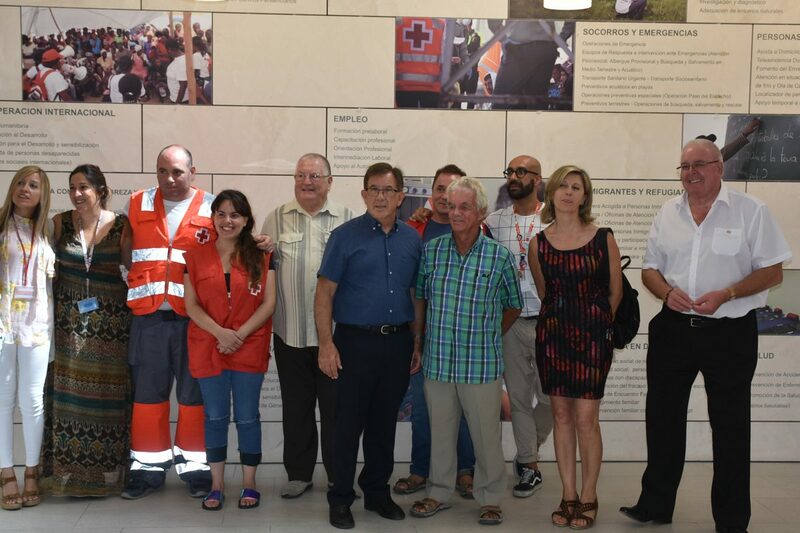 One of these support vehicles was donated to the Red cross in Alicante and Snr Dominguez and the team felt they would like to thank the Masons for their generosity in providing it and to show what had been achieved by their team since it was presented. The result was an extremely well-presented meeting at their headquarters in Alicante. 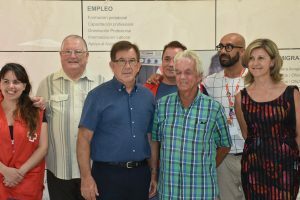 Snr Dominguez and his team started by explaining the wide areas in which they were trying to help the less fortunate people of the Vega Baja and other areas. of which, sadly, there are many. They try to help a wide variety of people including the homeless, immigrants, those facing natural disasters such as fires, very relevant when at present there are so many of these, and virtually every other misfortune you could think of. Until this vehicle was presented most of the help offered had to be given at the headquarters. They had often wished they could afford to obtain some form of vehicle but simply did not have the money. They were extremely proud to be the chosen recipients of the support vehicle which has changed their lives, and many others, for the better. They have since been able to provide help to hundreds of people and are now able to travel to them to offer help. The specially fitted out vehicle is fitted with hot water tanks and showers to allow people to have a shower when needed which before the donation was almost impossible. The vehicle is also able to provide a place where sometimes desperate people are able to meet and be helped. This help takes a large number of forms. It can be help with obtaining food and medical help, obtaining paperwork such as ID cards, help with personal hygiene, even such mundane things as chiropody. It allows them to be proactive rather than reactive. In some cases, it helps just to have someone to talk to and to be offered hope. In some cases, they speak to foreign consulates to help the people return to their home country. Originally the vehicle was used in 2015 to help people in the Guardamar, Seguro and Orihuela areas. However, by 2017 this area was extended to include Rojales, Santa Pola and Fulgencia. 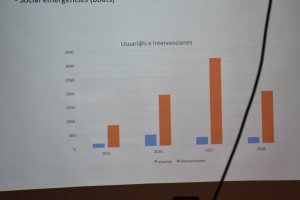 From thirty interventions in 2015 the numbers helped by 2017 had risen to over three thousand! They are hoping to increase these numbers even more in the future. The team are able to converse in several languages which help many homeless people by no means all of which are Spanish. Some are very reclusive having lived on the streets, in some cases for many years, and would probably not have approached the Red Cross directly. Now however, the Red Cross are able to approach them which has enabled much more help to be given than previously. The team now follow set but different routes every day each week so the people needing help know where to find them. When the people get to know and trust the team real help can be given. Almost all of this work, is done by volunteers and much is paid for by donations from various sources including the Freemasons. We were extremely impressed by the scope and breadth of the help offered and were extremely pleased to be invited by the team to be shown just what can be done with a little help and determination. 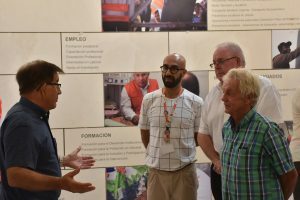 Our thanks must go to Snr Dominguez and the team and also to the hundreds of Masons around the Province of Valencia who made all this possible.